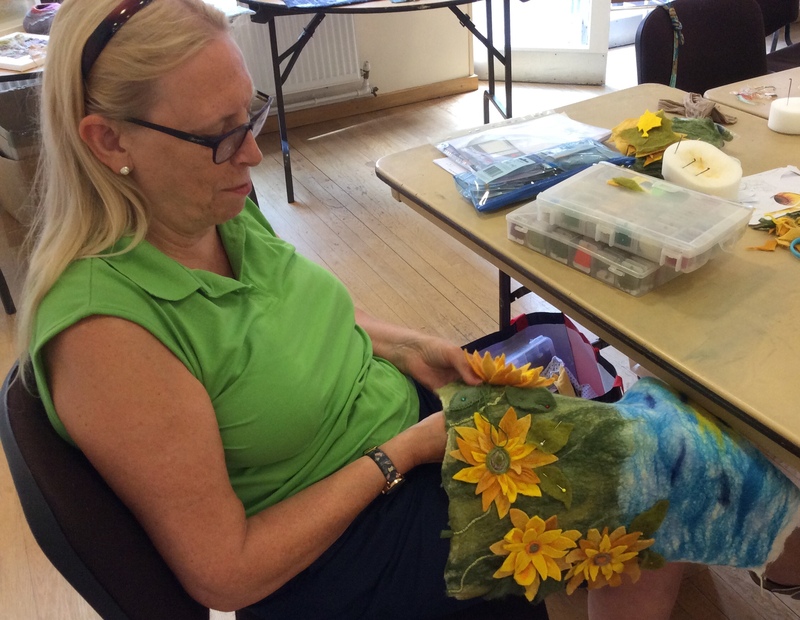 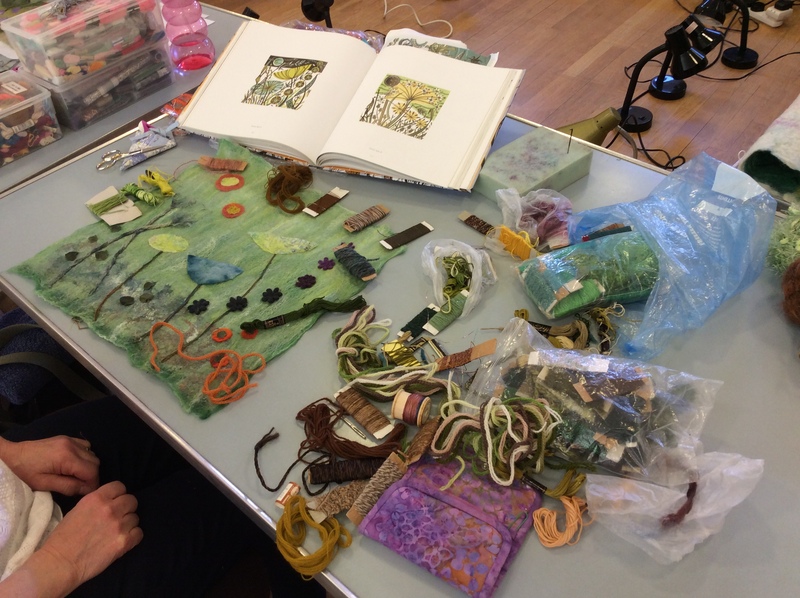 As promised photos from day two of the Yellow Poppies workshop in Hemmingby…..
Lou was the first to finish. 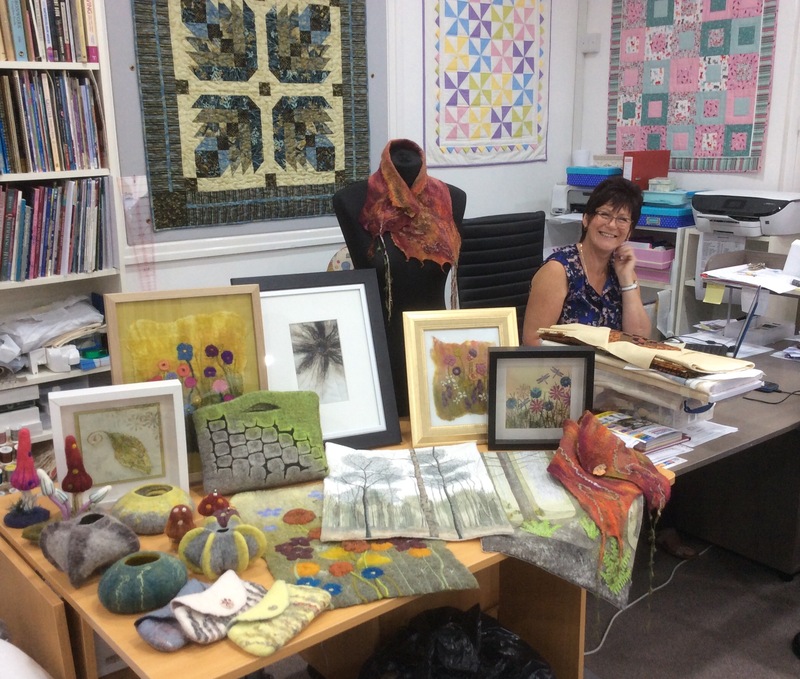 Having worked so fast she even managed a second piece of work! 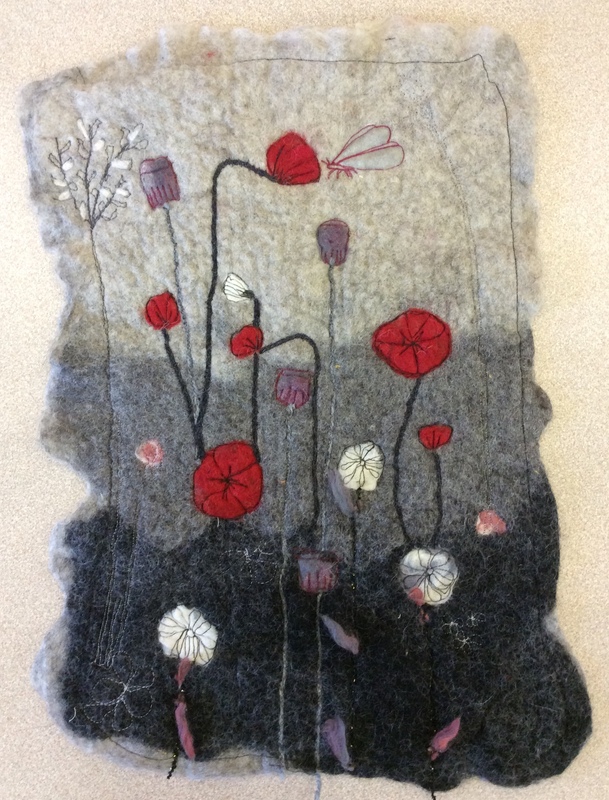 Ellie and Brenda still have work in progress so I will add photos of their finished work as and when I get them. 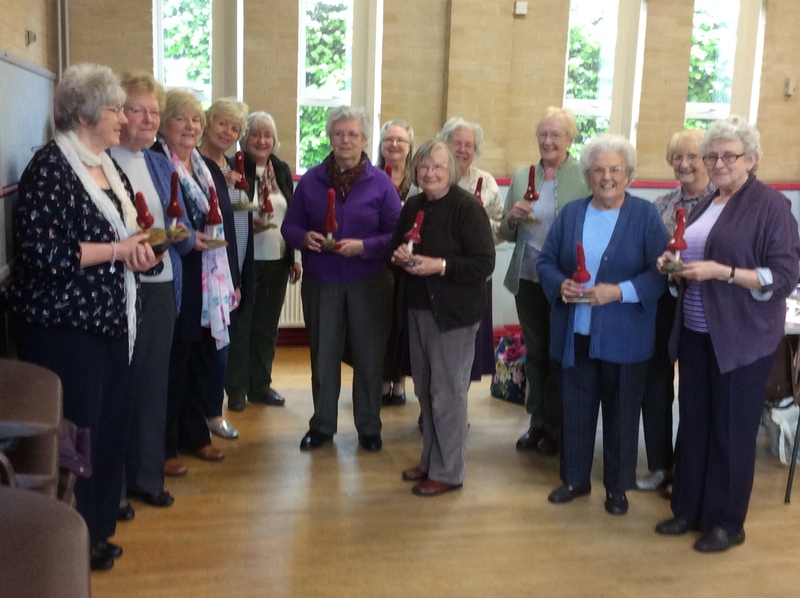 Many thanks to Ellie for inviting me over to Hemmingby and to all the ladies who took part. 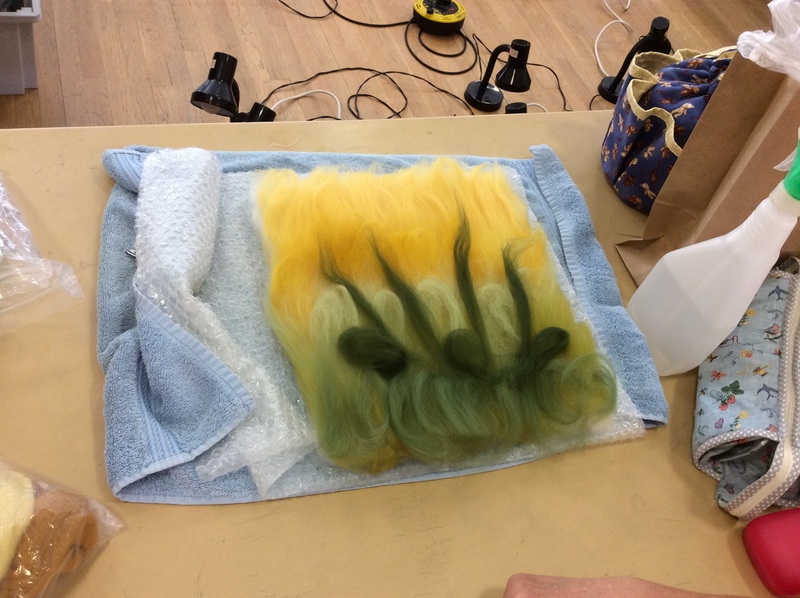 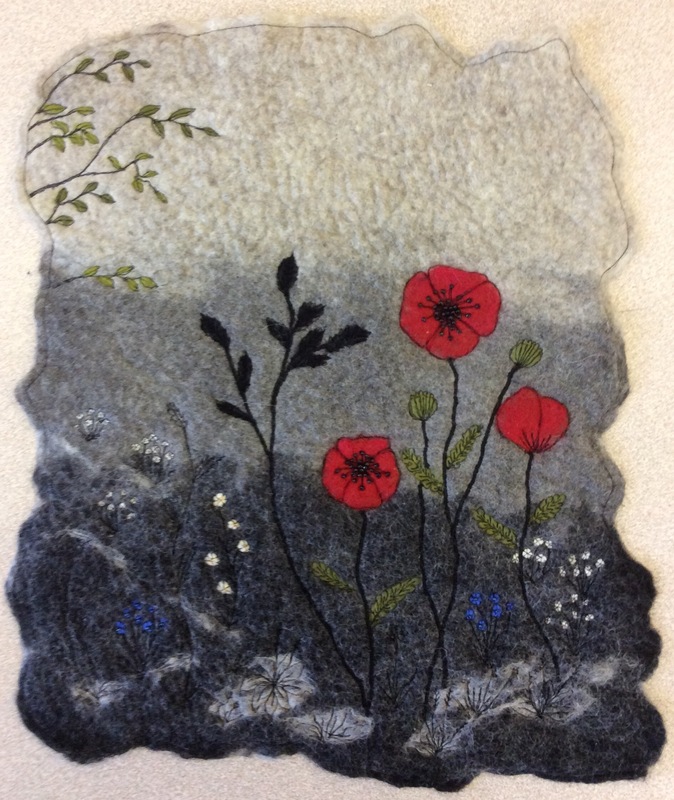 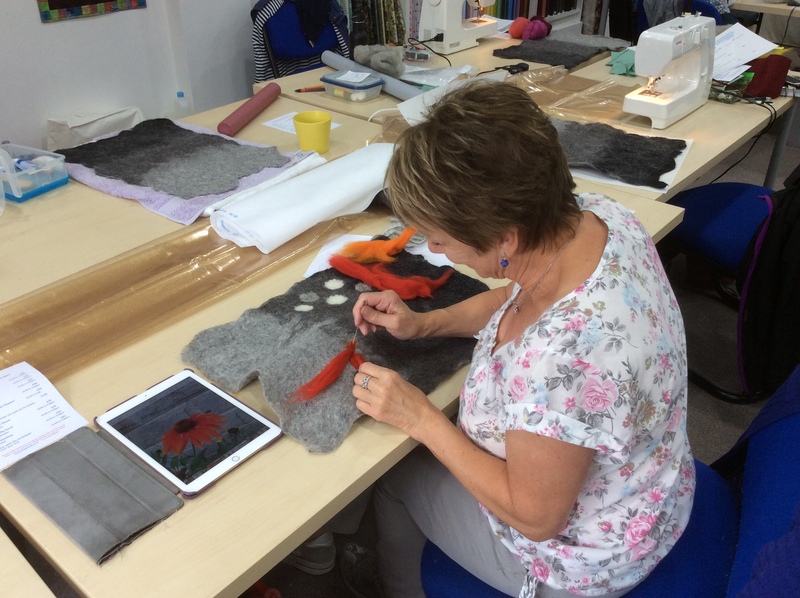 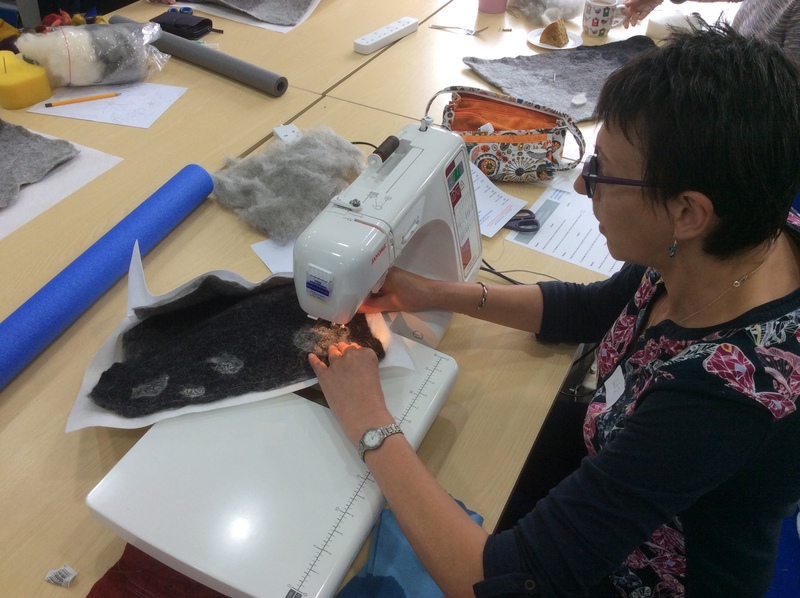 It’s probably too late to tell you now the workshops over but, as you may have already realised, felting is very addictive and can seriously improve your health….you’ve been warned! 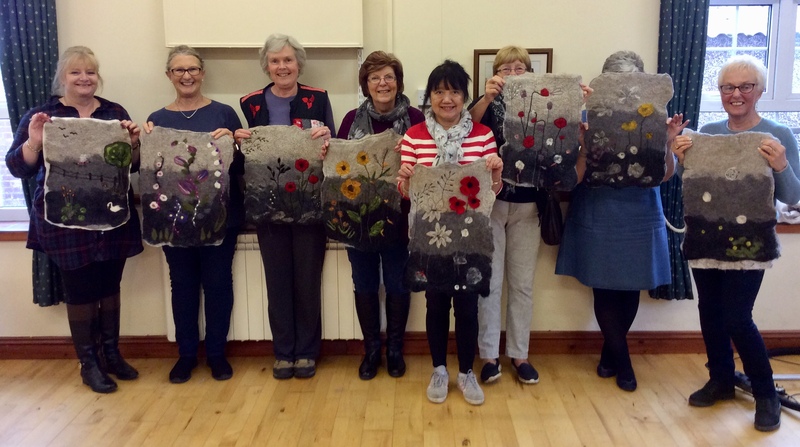 Today was day one of the Yellow Poppies Workshop at Hemmingby Village Hall attended by nine enthusiastic ladies all keen to learn a new skill. 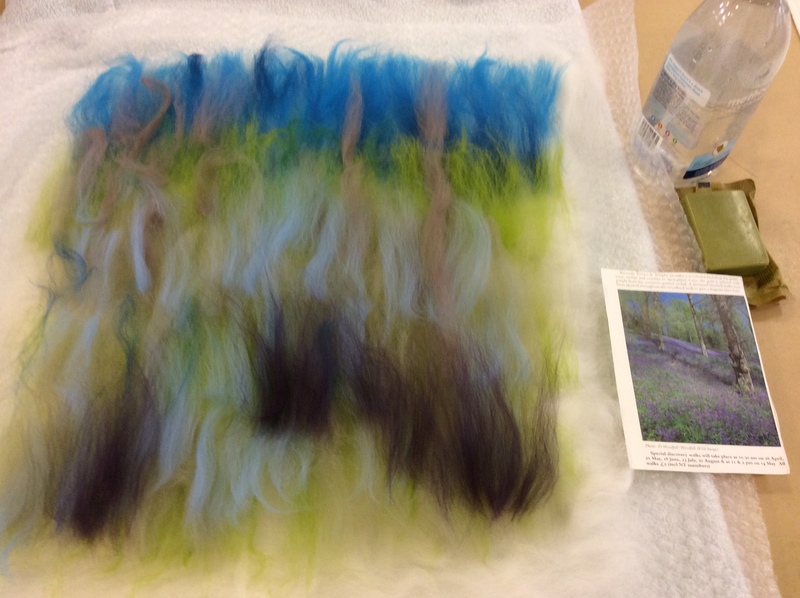 The morning was spent Wet Felting the backgrounds using three shades of Bergschaf wool. 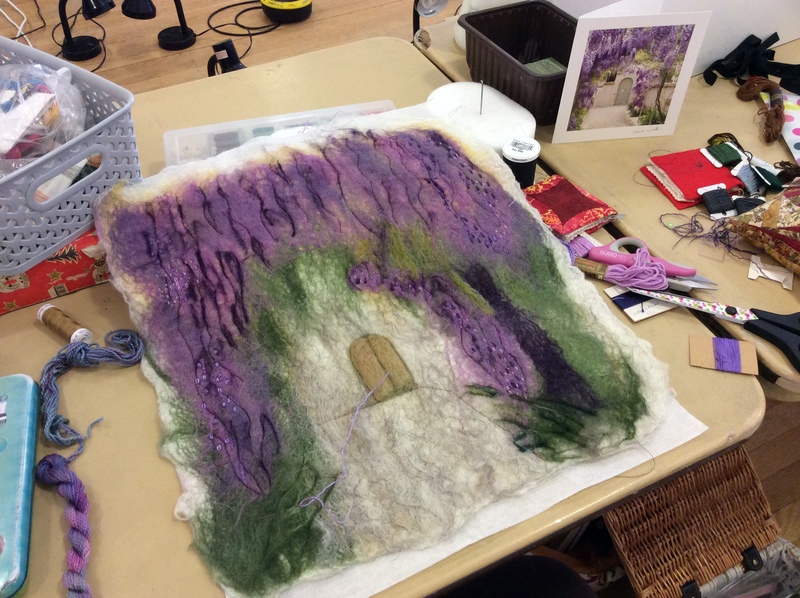 Once this was done the work was spun and put aside to dry while we had lunch. 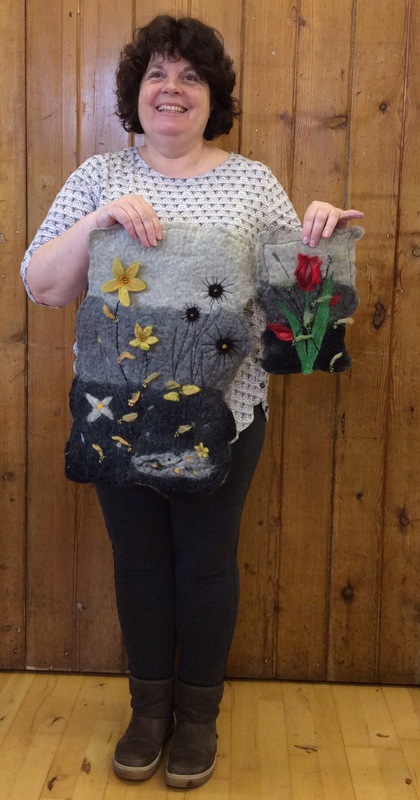 This afternoon Lou and Jani chose to make additional pieces of felt to cut up to use as 3D flowers while the others got straight on with Needle Felting their flowers directly onto the background. 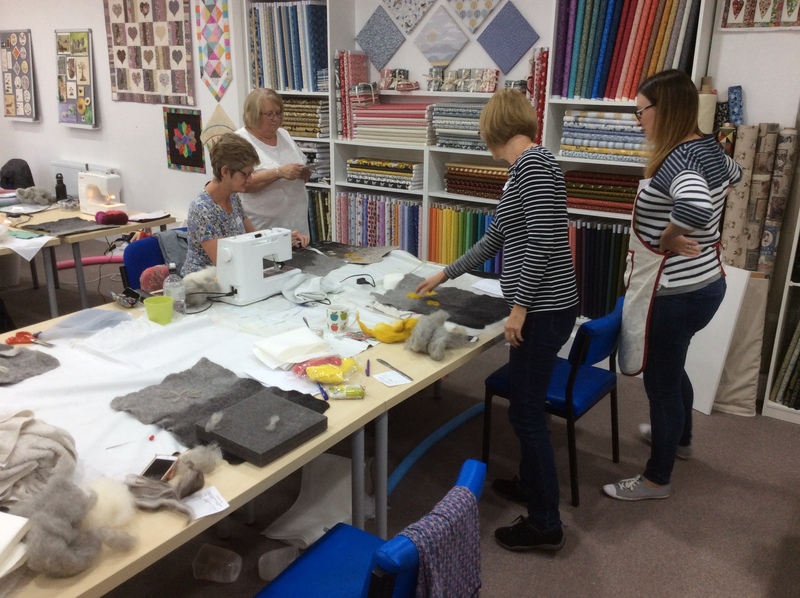 Tomorrow the ladies will continue embellishing their work with Needle Felting, couching, hand stitch and free machine embroidery. 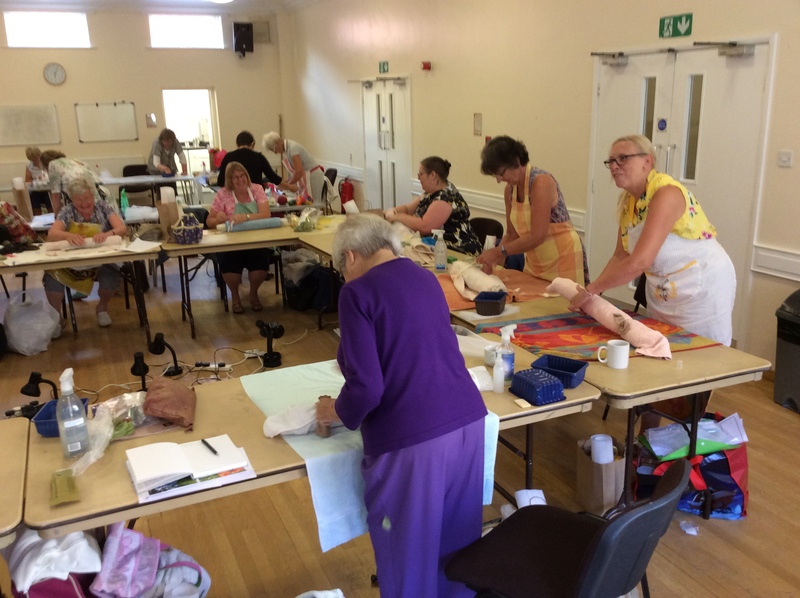 I’ve discovered an unexpected benefit of running local workshops……I’m discovering villages in Lincolnshire that I didn’t know existed! 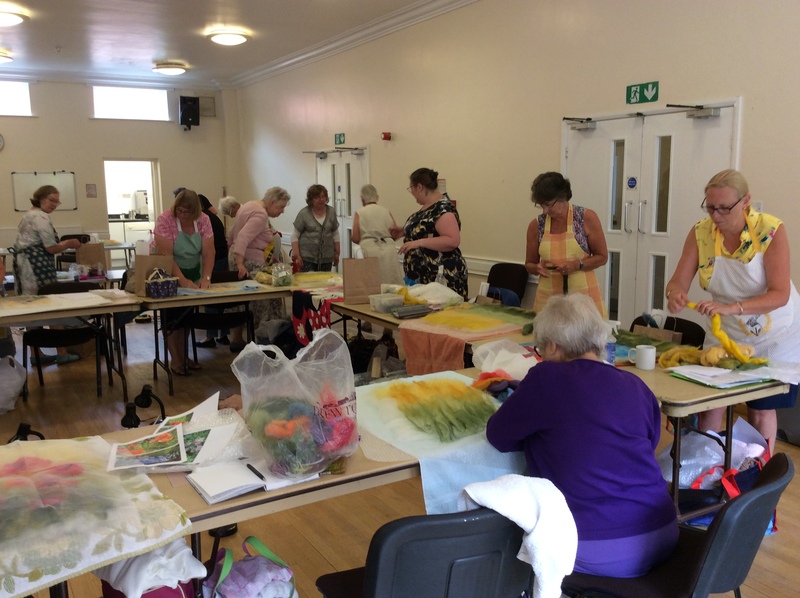 Today I was at Withern Village Hall, deep in the Lincolnshire Wolds for the first time ever, with seven ladies from the local textile and art groups. 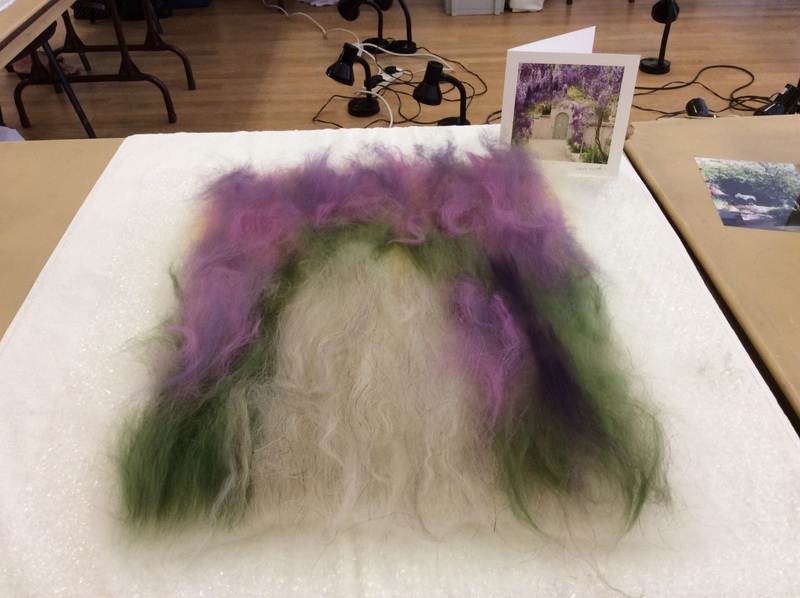 The workshop was to be an introduction to Felting so we began by laying out our Merino fibres and fancy yarns and then wet felting our backgrounds. 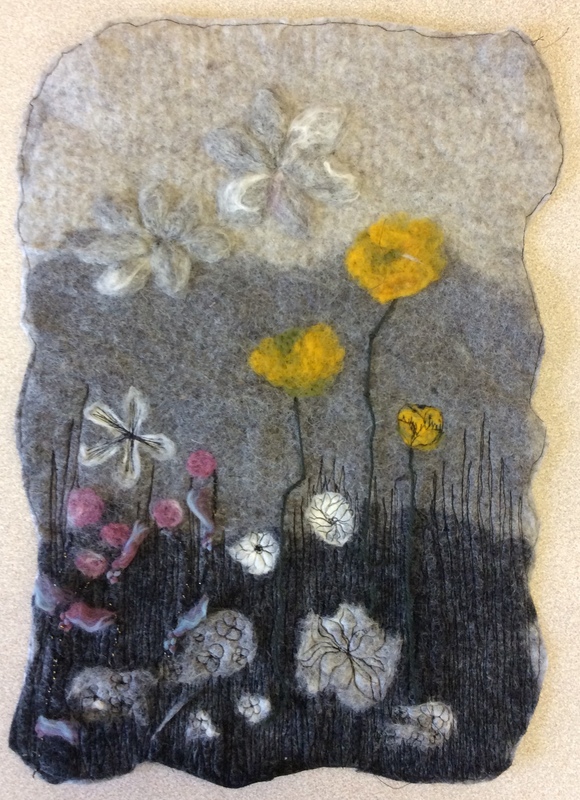 After lunch we did some needle felting, adding detail to the work, and then the ladies chose to either machine or hand embroider to further embellish their pictures. 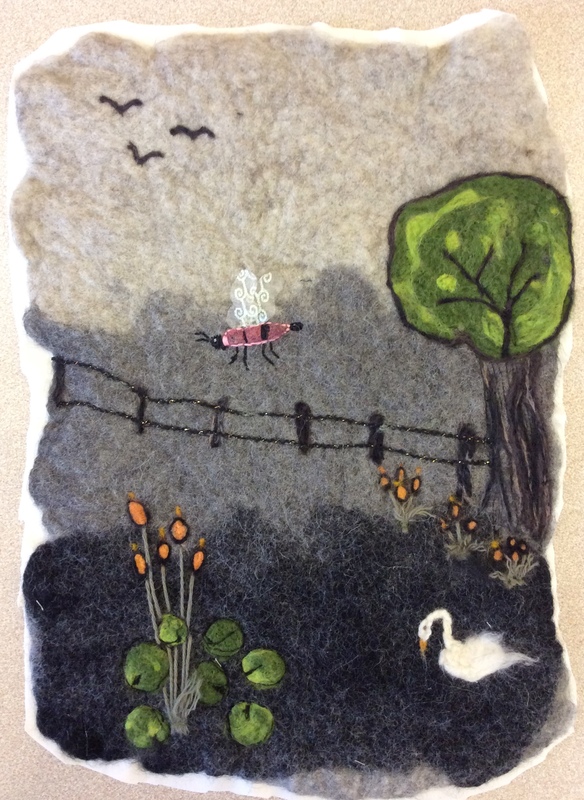 I love the tiny bees on Kay’s picture! 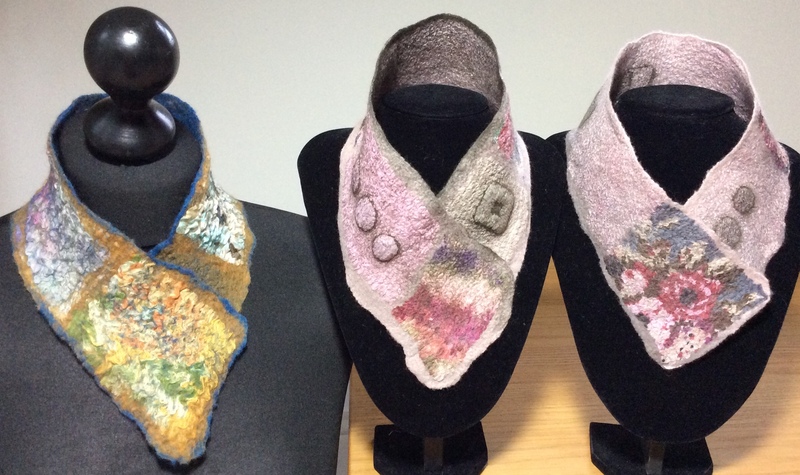 There is still a little work left to do before all of the pieces are finished but I’m sure you will agree they are all looking great! 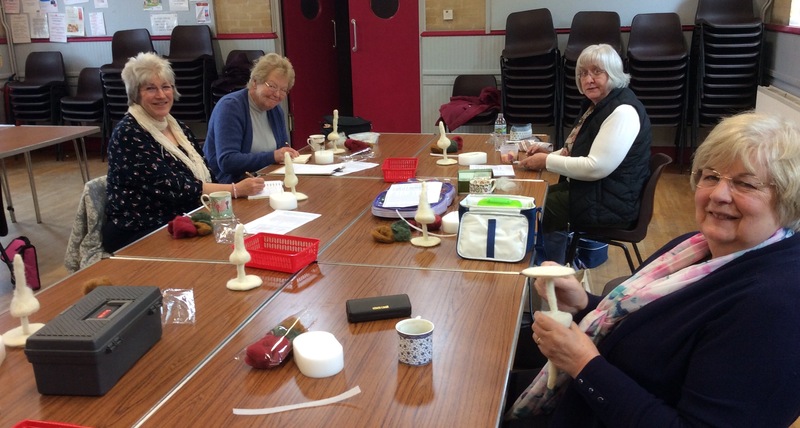 Thanks for inviting me to Withern, and for being such an enthusiastic group! 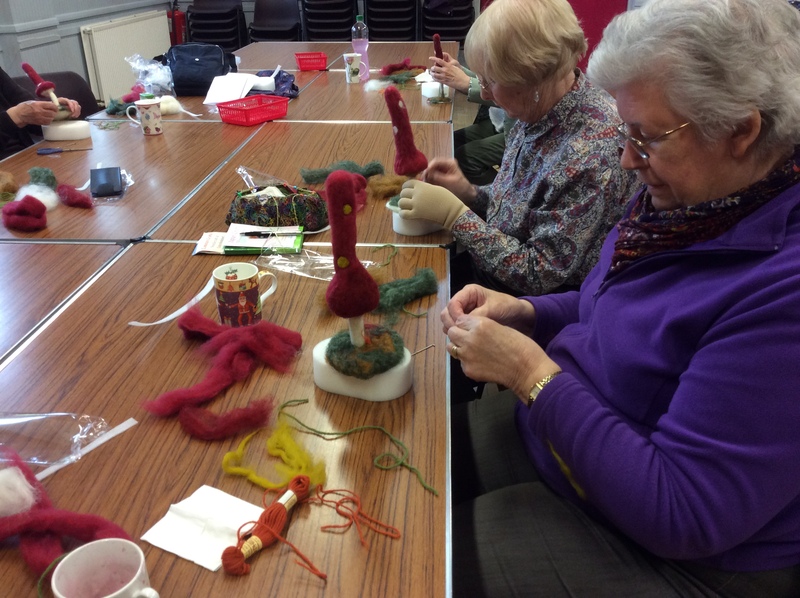 It was a very enjoyable day and I hope to see some of you again soon. 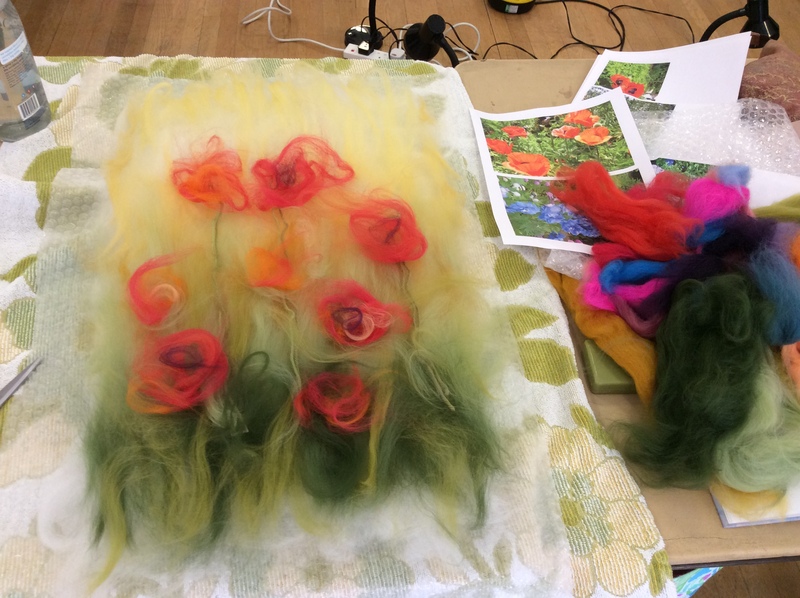 A quick post to show how Alison and Yvonne have got on with making their beautiful versions of my Yellow Poppies wet felted wall hanging today. 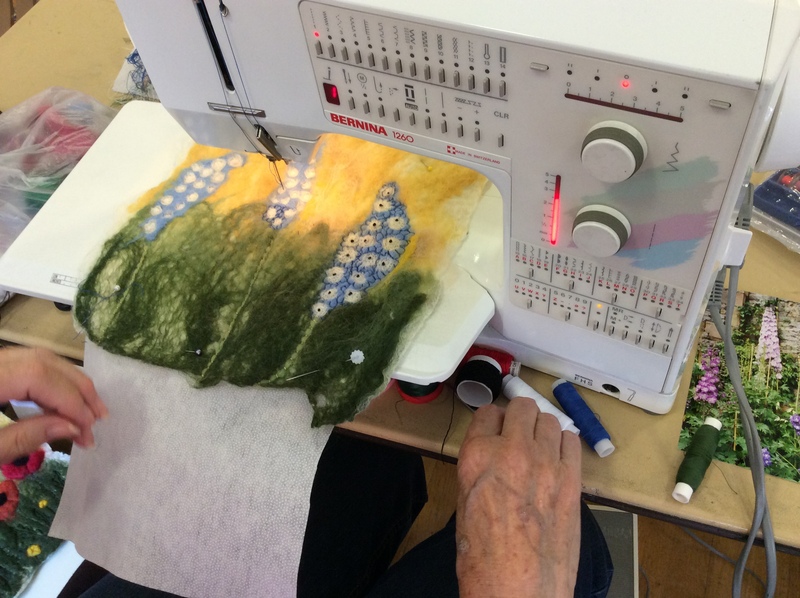 Alison was quite at home with the free machine stitching while for Yvonne it was her first attempt and she admitted that she had got on far better than she thought she would. 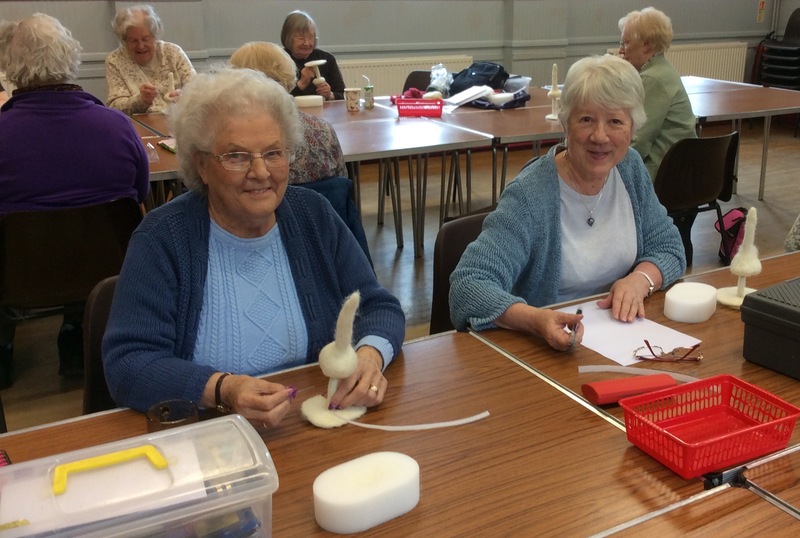 Just the mention of free machining sends some folk into a state of panic but with a few basic pointers I find most people overcome the dread and start to enjoy it. 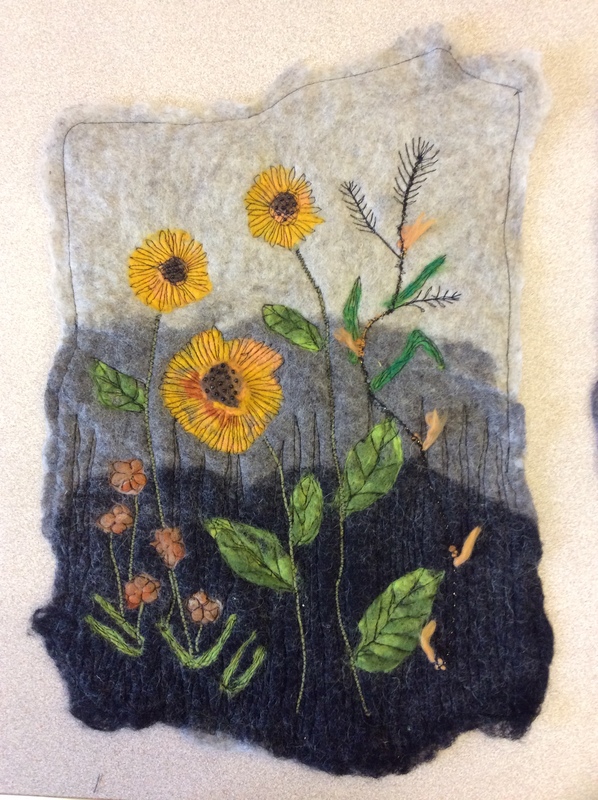 Both pieces are looking lovely but there is still some work to be done so I will post an update once the ladies have finished their pieces. 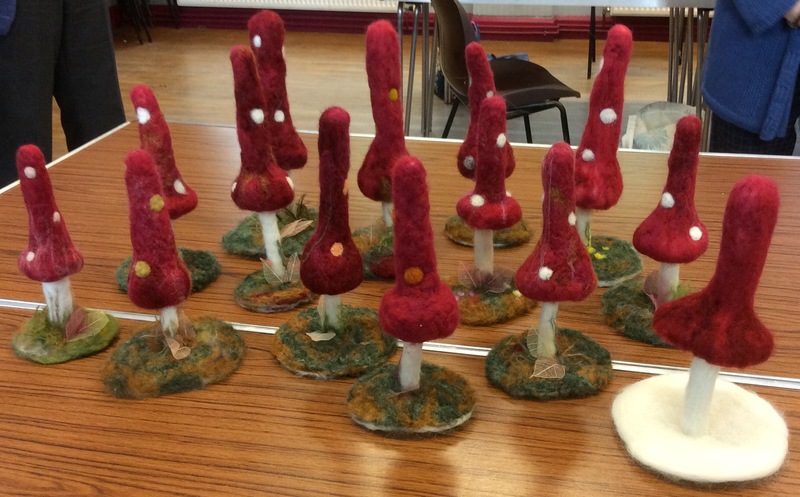 I’ve just been informed that we still have spaces left on my Needle Felted Mushroom Workshop which will be held in Alford on the 9th February. 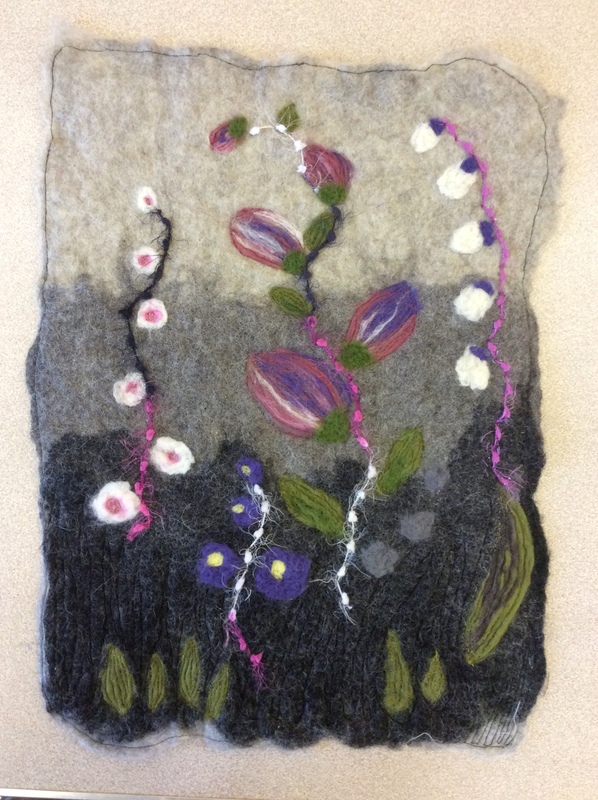 This workshop is suitable for absolute beginners as well as those who have experience of felting. 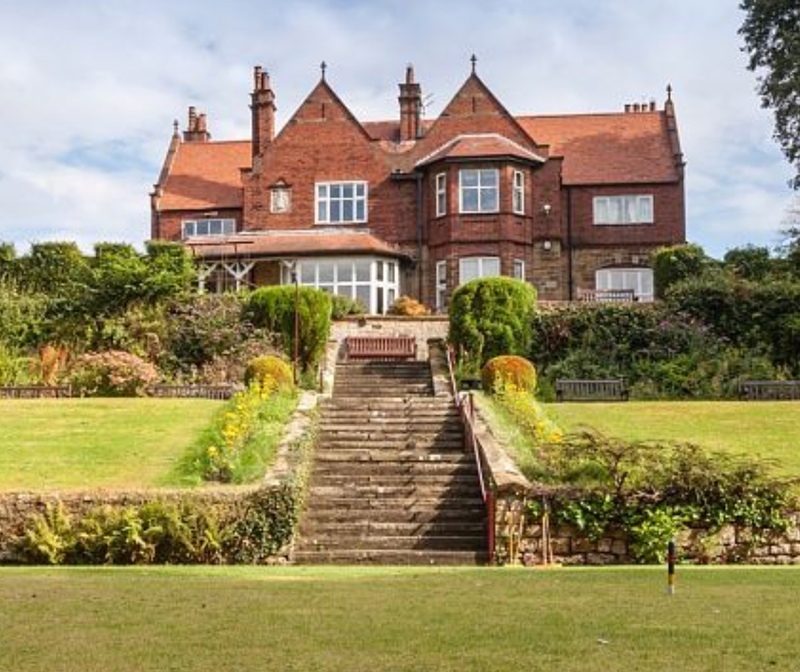 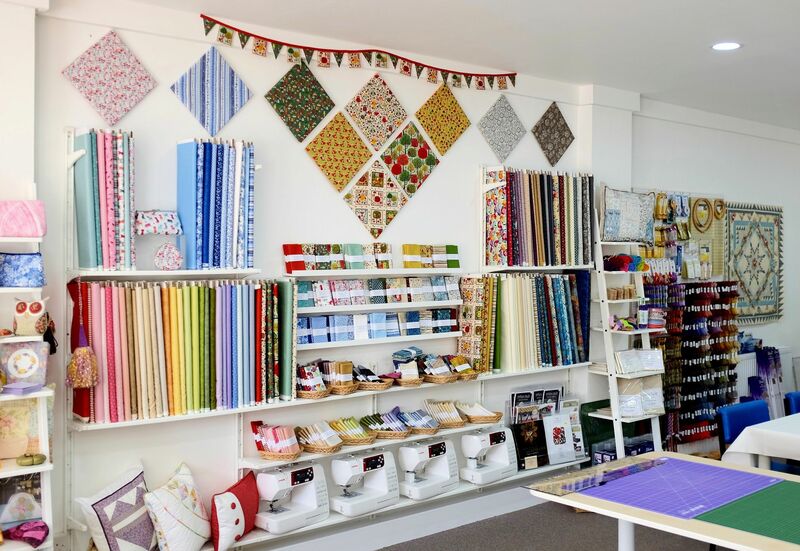 If you would like to book please contact the Alford Craft Market via their website http://www.alfordcraftmarket.co.uk or call Lynne on 01507 463341. 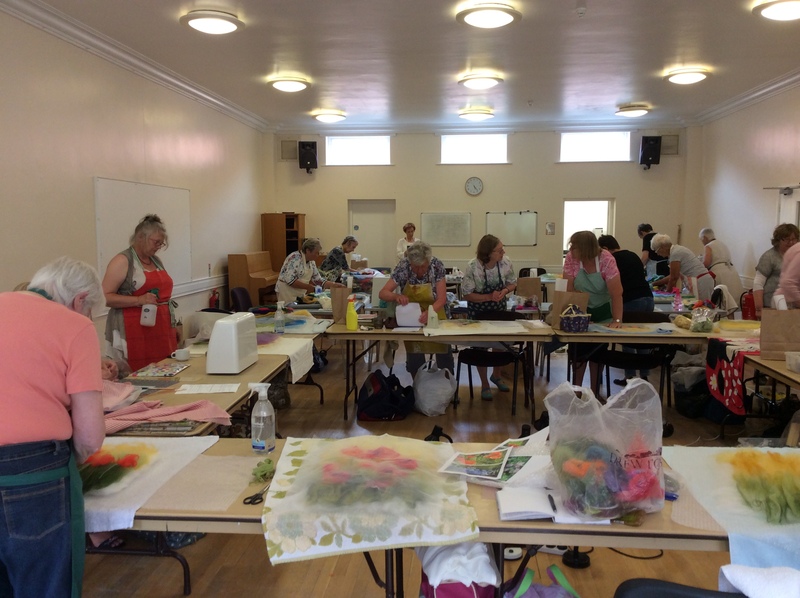 This morning I travelled down to Pode Hole, in the Lincolnshire Fens, to deliver a needle felted toadstool workshop for the Spalding Embroiderers. 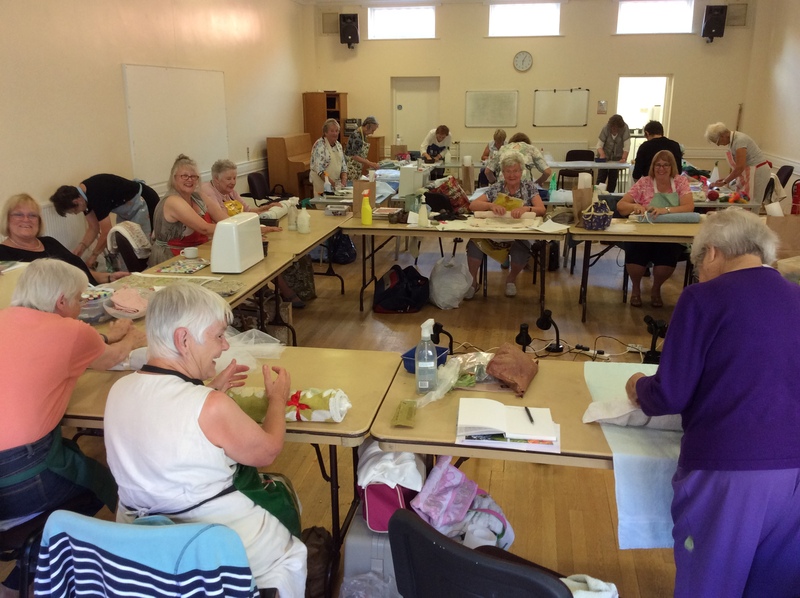 The ladies had expected to be doing a beading class but unfortunately the tutor couldn’t keep the booking and I was asked if I could step in at short notice, which I was only too pleased to do. 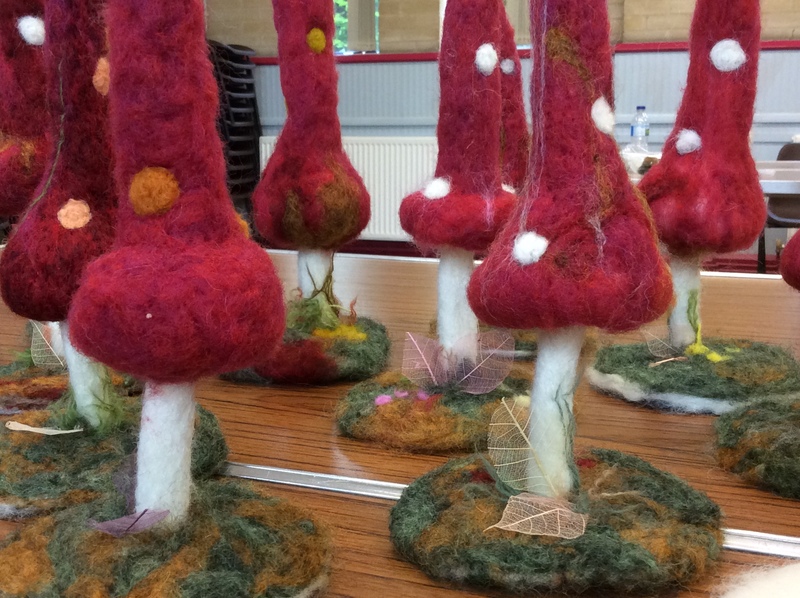 We began by making the three main components, the stalk, base and top of the toadstool using white Cheviot wool from World of Wool. 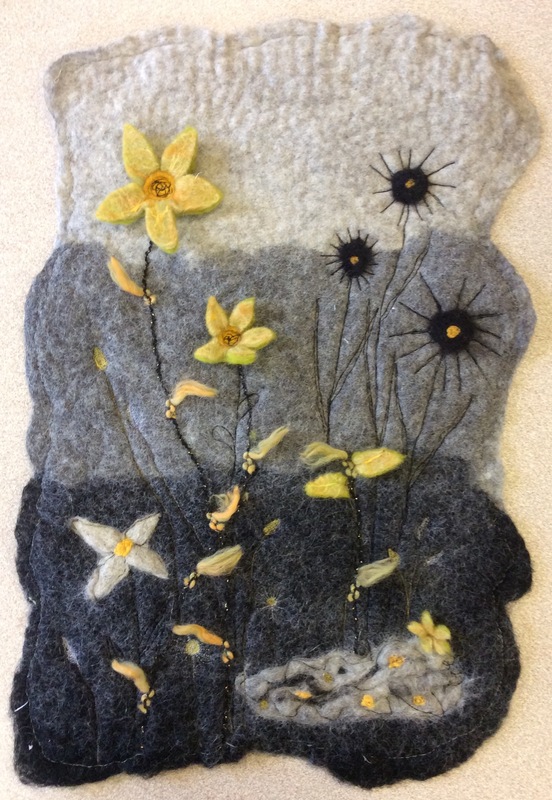 Cheviot is a good choice to use as ‘core’ wool as it is inexpensive and needle felts quickly. 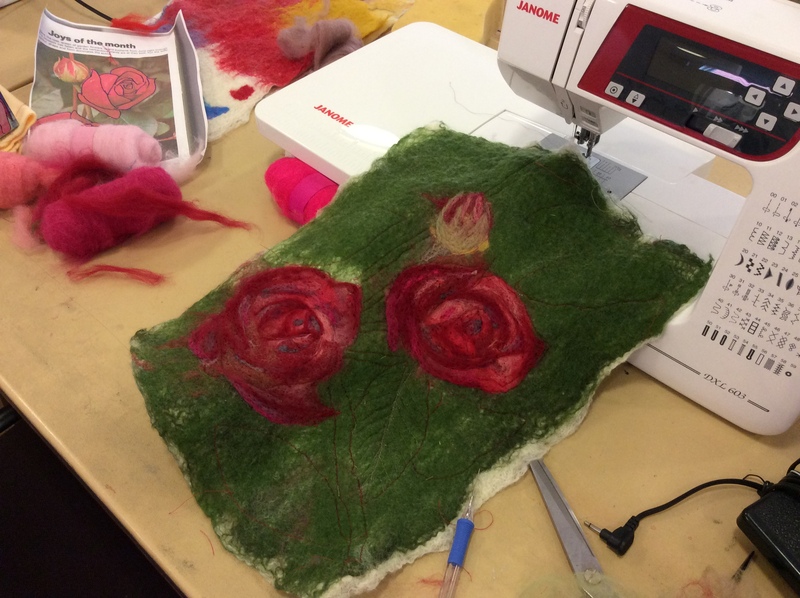 Once we had joined together the three elements we covered the top of the toadstool using WoW’s carded Corriedale in sour cherry (Tutti Frutti collection) and Pinwheel (Galaxy range). 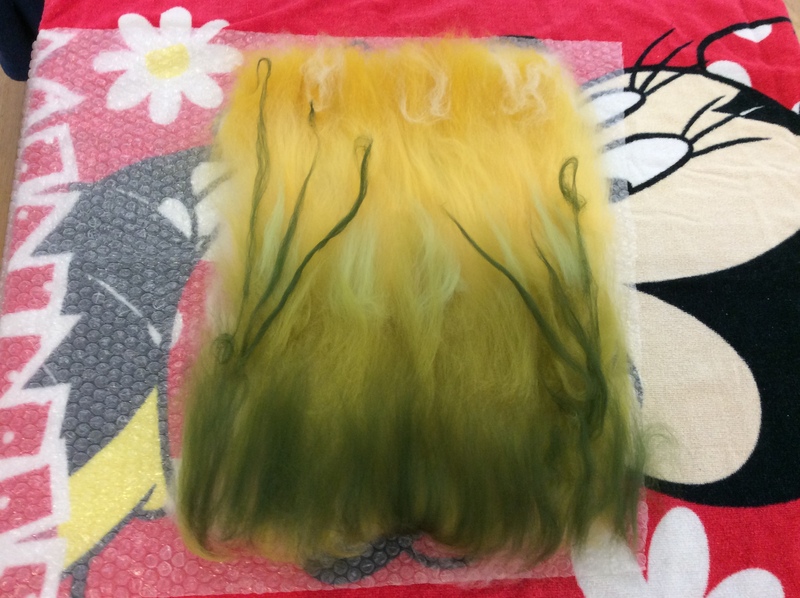 The base was covered in a combination of Tadpole and Sombrero, again from WoW’s Galaxy range. 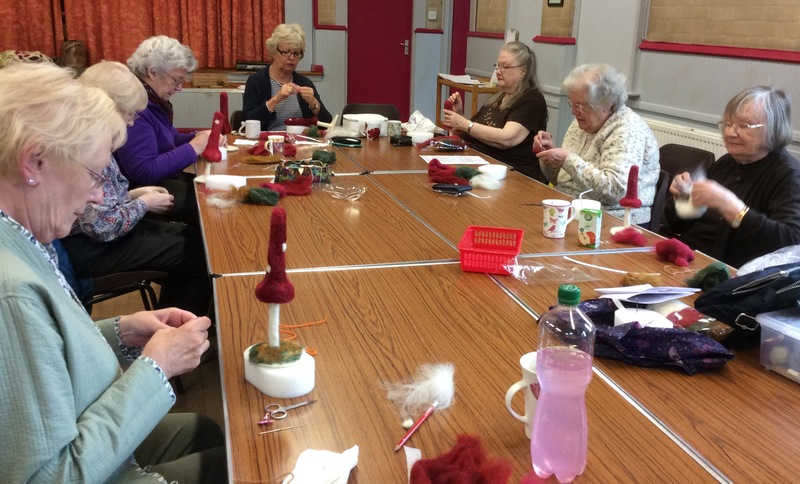 For a lot of the day you could have heard a pin drop….the concentration was so intense! 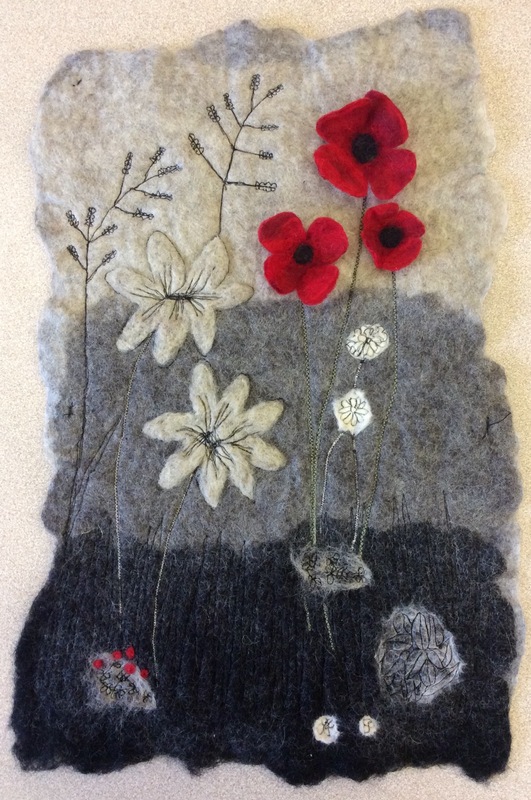 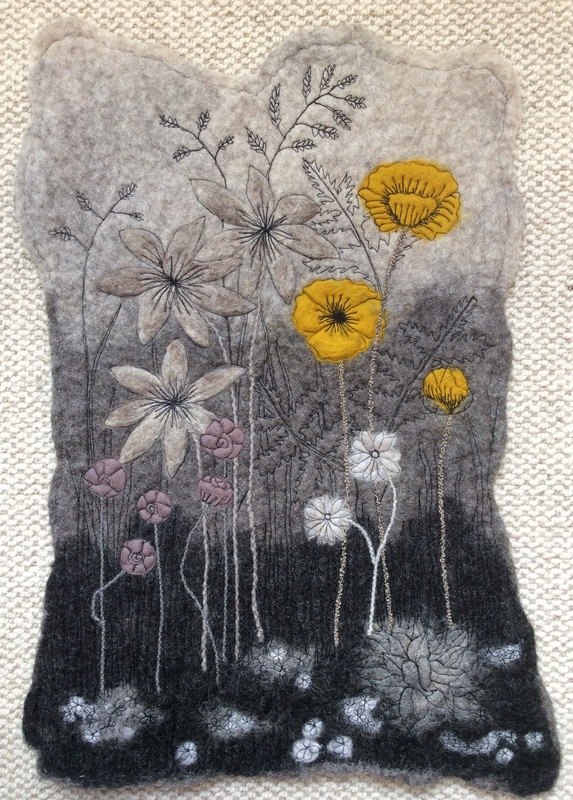 Detail was added using small skeleton leaves and tapestry wool for grass. 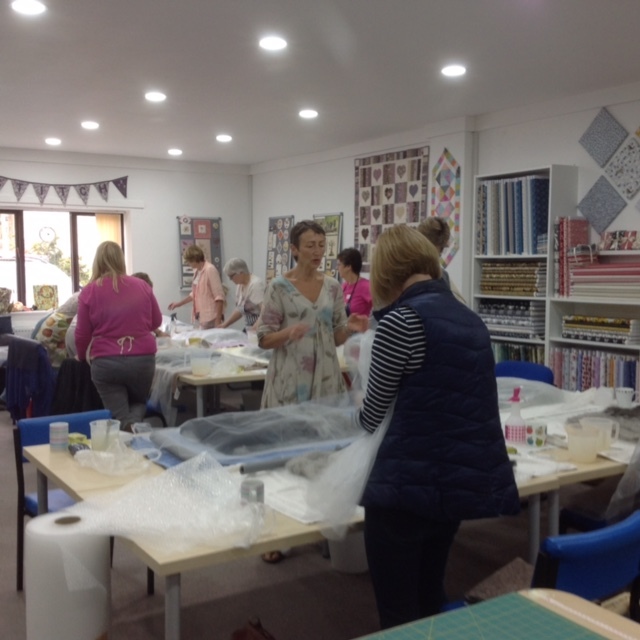 Once again it was a really enjoyable day in the company of a very creative group of ladies. 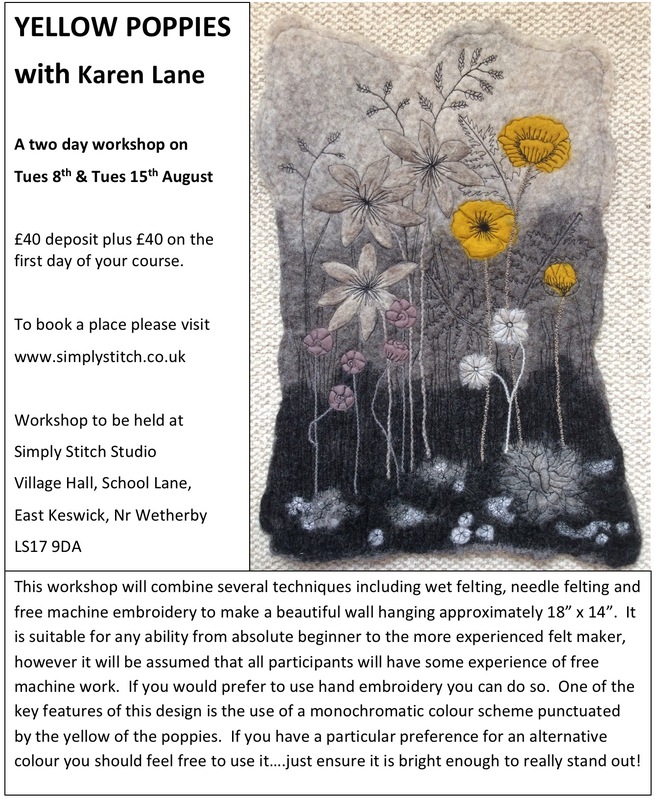 My thanks to Liz and Mavis for inviting me back and I’m now looking forward to our next workshop!